I’m coming to you from beautiful Old Orchard Beach in Maine! This post is entirely done on my phone, so bear with me! 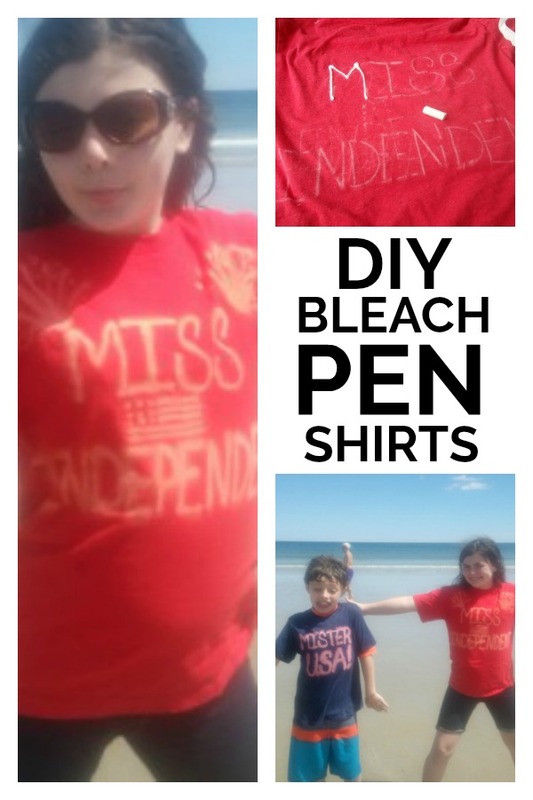 I really wanted to make t-shirts for the kids and I had seen some cute ones on Pinterest made with bleach pens. That’s Mr. USA on the left and Miss Independent on the right! These were super easy to make. Here’s a mostly pictorial tutorial. You’ll need a T shirt, some chalk, a bleach pen or two and some type of flat cardboard to insert into the shirt so that you’re bleach doesn’t bleed through to the opposite side of the shirt. Step 1. Insert a piece of cardboard into the shirt. Lay the shirt on a flat surface. Step 2: Use the chalk to make a rough draft of your design. Do not skip this step and go straight to the bleach. Trust me. I erased my chalk renderings a couple of times before I was happy with the way things looked. Step 4: Trace over your chalk outline with the bleach pen. This part is way easier than I thought it would be. Step 5: Allow the bleach to dry for about an hour. Step 6: Rinse the bleach from the shirt in cold water. After rinsing you may decide to go over your design with the bleach again. I did this on the red t shirt. The blue one didn’t need it. Step 7: Wash your shirt as you normally would, but you may want to wash it alone or with whites only.